Jaggery is a traditional non-centrifugal cane sugar which is widely consumed in India (Asia) and Africa. Jaggery is usually mixed with other components like coconut, white sugar peanuts, condensed milk which helps to produce numerous locally sold and consumed delicacies. Even though the word “Jaggery” is usually used for the molasses gained from the juice of sugar cane but it is also prepared from the sap of palms such as Date palm, Toddy palm, Palmyra and some other plants as well. Jaggery is highly rich in vitamins, minerals, salts and even comprises of some other fibres. Jaggery does not increase the sugar level of the blood very quickly because it is much more complex than refined sugar. 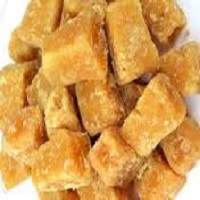 Jaggery is usually adulterated with metanil yellow (a coal tar dye) and sodium bicarbonate.